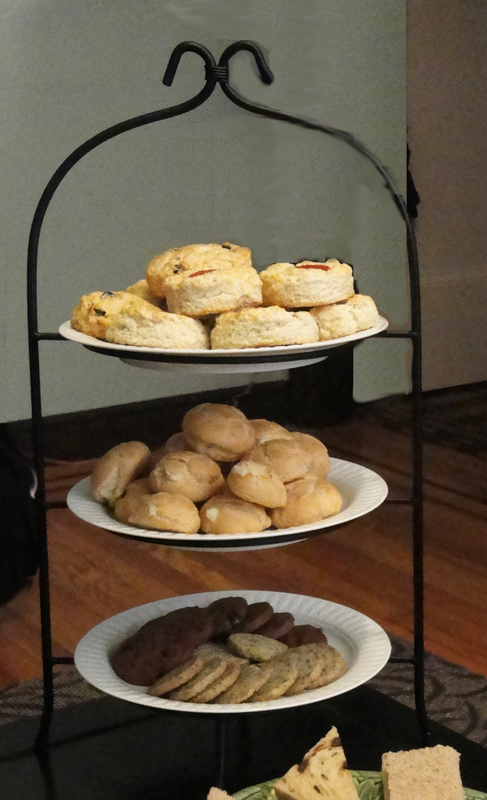 Time for Cookies, Scones and Cakes! As the holiday season is upon us again, it is time to think about family dinners and gift giving. It does not have to a nail-biting time or a head-scratcher. 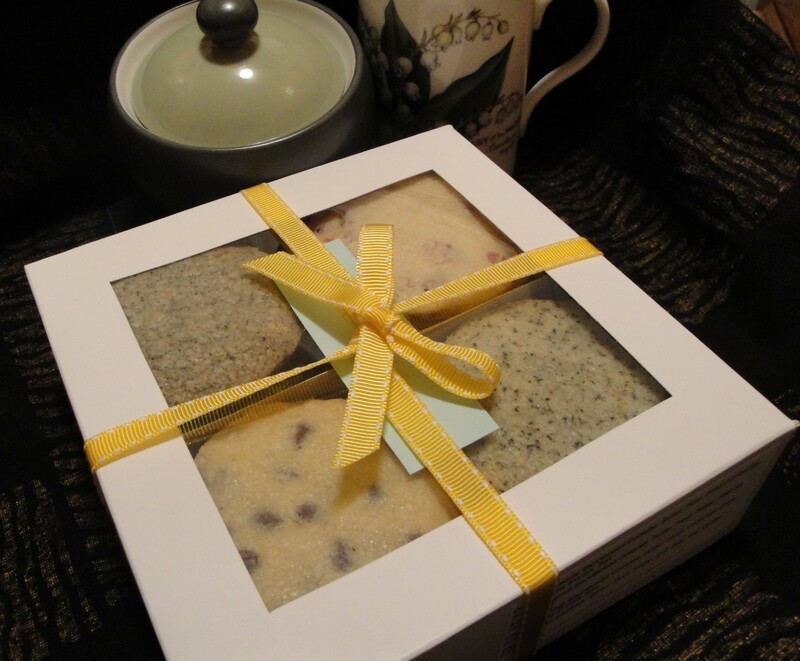 Let Twee-tea-licious (www.tweetealicious.com) be your go-to place for your time of gift giving. For more information, please go to www.tweetealicious.com for more information. I have been experimenting with different types of cakes, thinking that they would be a great addition for afternoon tea parties and general birthday parties. Then, two weeks ago while having lunch with my friend, HH, she all of a sudden thought it might be a good idea to have me make her son’s birthday cake. 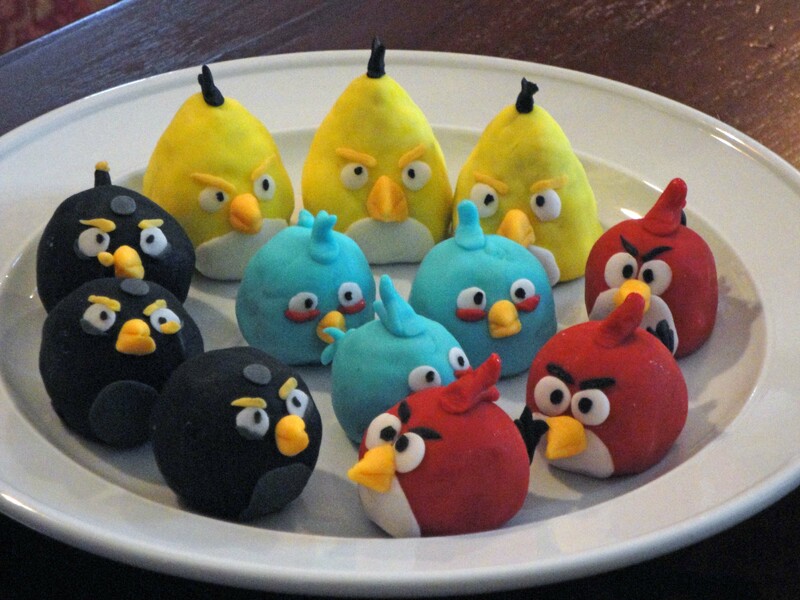 But, here’s the challenge – Keller specifically requested an Angry Birds cake and a possibly playable cake! It seemed to be a daunting task as I had never attempted making a cake with multiple colors and multiple characters let alone playable. Intrigued by the proposal, my brain started cranking out of ideas of how to make this all happen in 3 weeks, oblivious to the twist which was about to unfold. The main challenge lied with the characters. 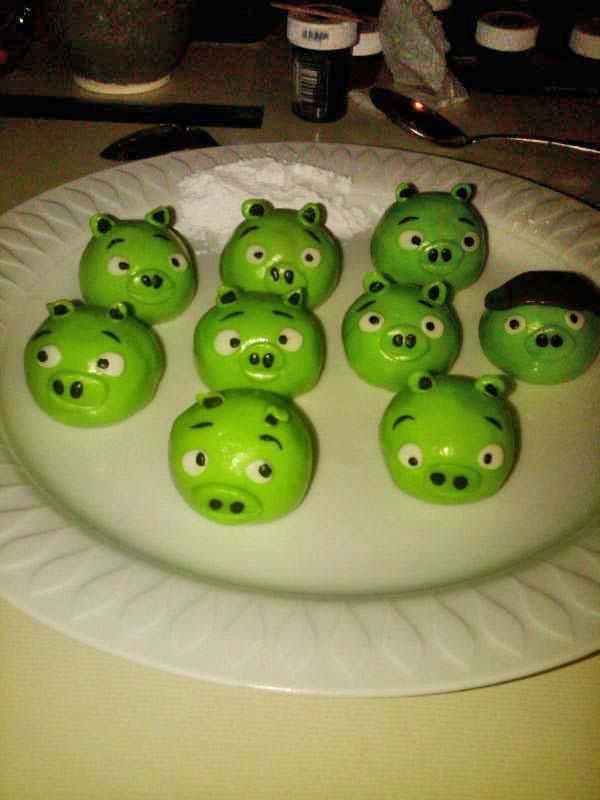 I wanted to make sure that the characters were not just barely edible but actually tasty and made with as little artificial product as possible. At the same time, the birds had to be made in a way that they could still be intact while being handled by children as they fired the birds off with a slingshot. I did a little bit of research to find the best material suitable. I settled on making the characters with chocolate cake balls covered with marshmallow fondant to go with the double chocolate cake which was Keller’s favorite. While the pigs could be at room temperature, the birds needed to be frozen in order to withstand being the slingshot pebbles. To abide to my mission, controlling the taste and lessen the amount of artificial elements in my product, I spent the first few nights making the cake centers and the marshmallow fondant from scratch. While waiting for the cake to set in the freezer, I made the marshmallow fondant in different colors that would be used for each of the characters. 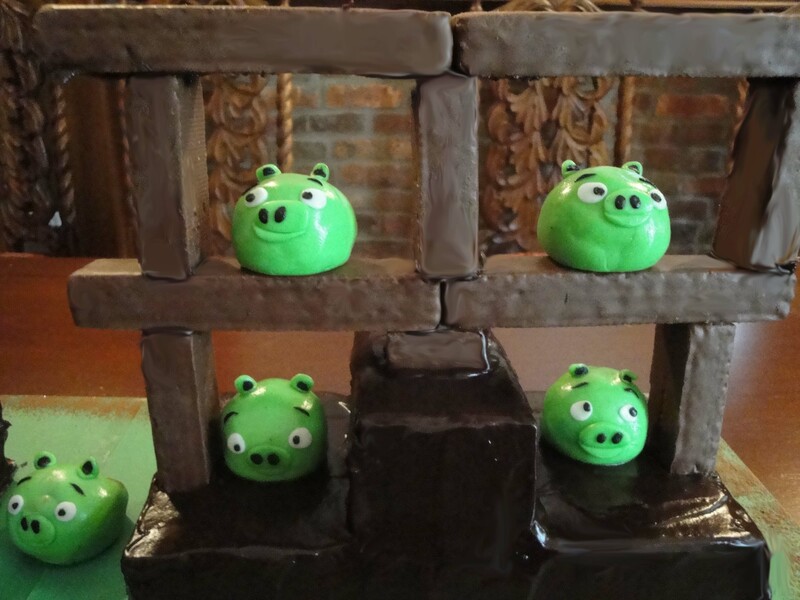 Then came the making of my first character – the green pigs. Each feature of the pig had to be cut and rolled and applied. I wanted each of the pigs to have its own characteristics. So each pig had its own unique facial expression. One looked jolly, one looked playful and another looked goofy. They turned out to be really adorable! As I originally thought I had 3 weeks time, I felt good that I was able to accomplish making the pigs early in the game. I planned out to make different components of the cake each day starting a week before the actual event. Then, a week plus a day to the event, my friend dropped the bomb on me. Due to a schedule conflict, Keller’s summer camp had to move the birthday event up by a week which would be the following day! 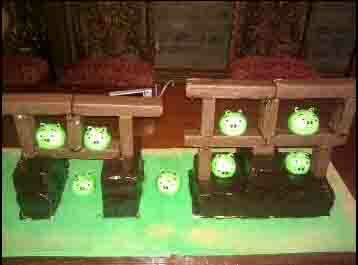 At this point, besides the pigs, I had nothing else made yet and I only had 19 hours to the actual event! HH was ready to give up on the idea of a playable cake all together and settle for just a cake with couple characters sitting on top. 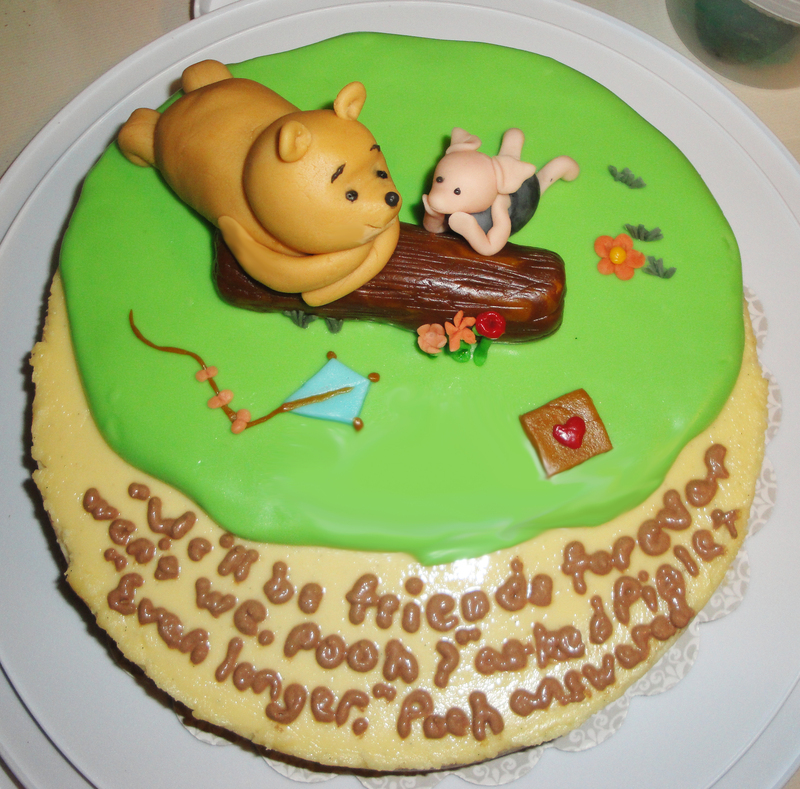 While I did not want to bite off too much than what I could chew on, I made no promises than the simple cake. But, being the perfectionist I am, I really did not want to disappoint my six-year-old friend who was looking forward to his birthday. I was trying very hard to plan out in my head how it would be possible to still make the full version of the cake, or at least, most of it. On the train home, I conjured up a plan of attack. I embarked on this “mission impossible” as early as I could at 7:00 PM. Although my original plan was to make the wood, concrete and ice blocks from scratch as well, I decided to forgo this by replacing them with ready-made wafer pieces covered with chocolate to mimic the wood blocks. 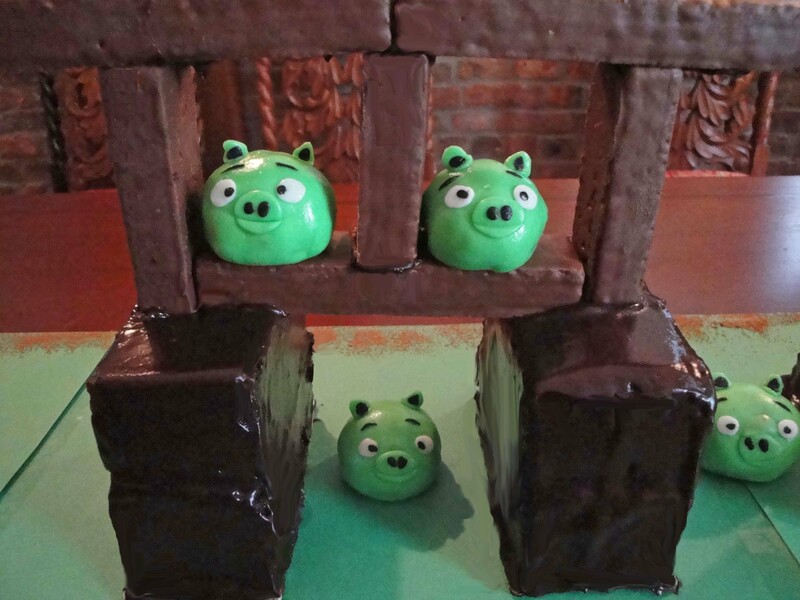 While I sent my husband on the errand of getting last minute material, I started off with baking the cake which would be the base for the building structures of the pigs. 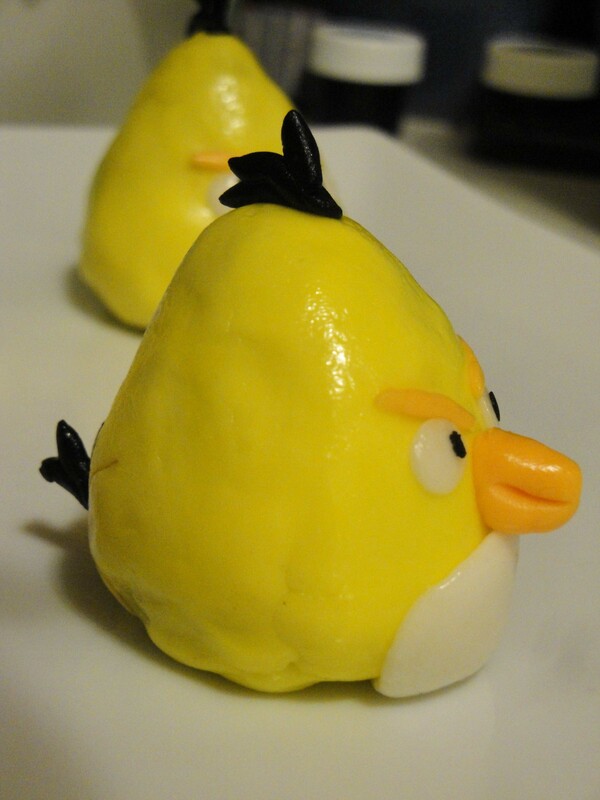 While the cake was in the oven, I started rolling up cake balls for the cake center of the birds and then put them in the freezer to set. 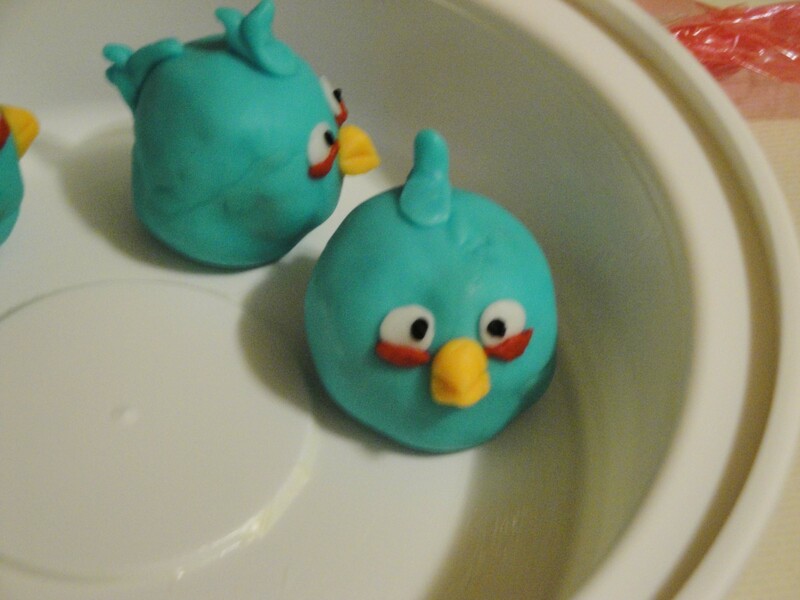 Next was to make additional color fondant required for the birds. Then it was time to start making the birds. 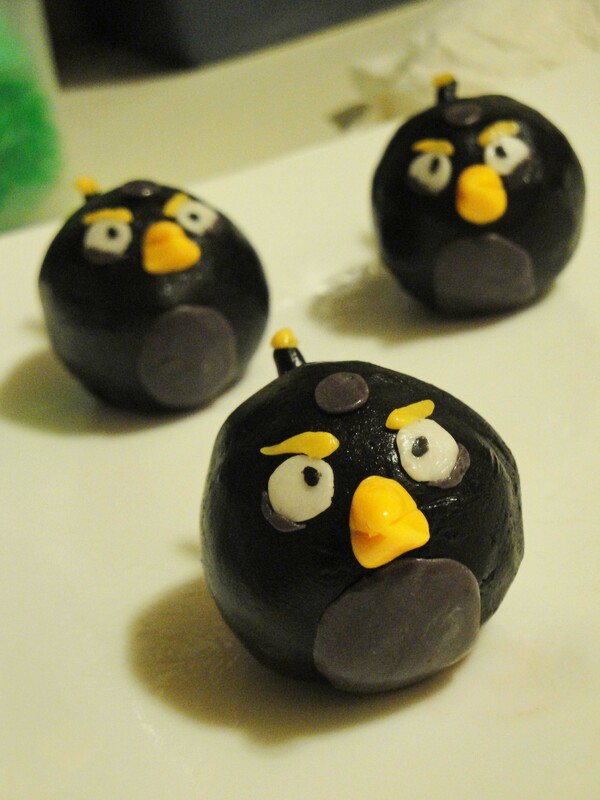 The eyes, irises, beaks, eyebrows, eyelids, belly patch, feather crowns and tails all had to be made one by one individually and applied onto the fondant covered cake ball. I plodded along from one bird to the next not caring about time. As the clock struck 1:30 AM, I was finally ready to cut the cake to the blueprint I had scribbled on a piece of paper while my husband worked on the cake boards and foam bases. Final time check-3:30 AM. The cake segments were finally set with chocolate ganache and all components made, ready to be packed for the setup for the event next day. We collapsed into bed. I took my lunch time to go to Keller’s summer camp for the cake setup the following day. 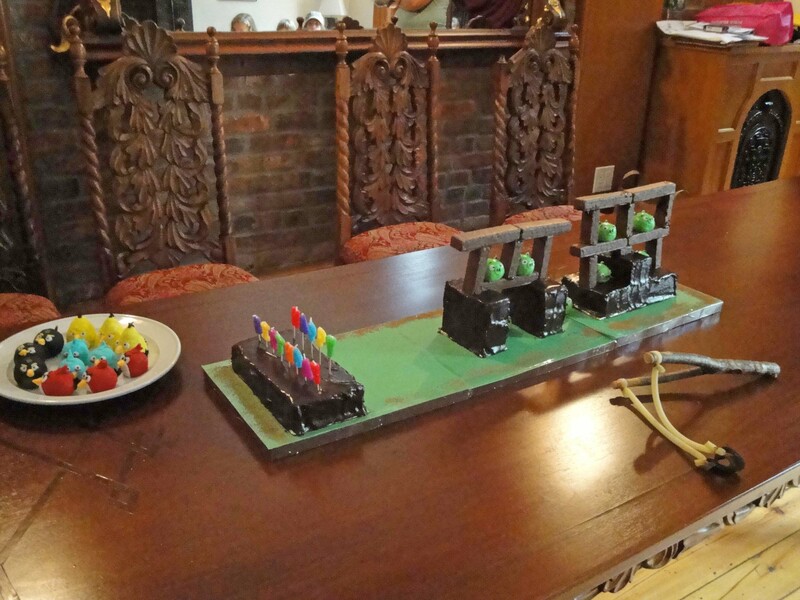 The cakes were set onto three bases, with two bases to the right for the pigs and building to be demolished and the left piece as a platform for the birthday candles. As HH helped me with frosting the wafers to stack up the building structures, I placed the cute little pigs into their target spots. The colorful birds were taken out of the freezer and set onto a plate really to be fired off. Then came the true test of facing nine children who would be my most brutally honest judges. The kids giggled and squealed as they flooded into the room and saw the little display. As the teachers finally quieted them down, the rules were laid out that each kid were to get one shot at the pigs and could eat up the bird they fired after the shot. Unfortunately the adult size slingshot was too much for the kids to maneuver. As a result, although almost all the birds were shot off, the building and pigs remained completely intact. The pigs almost won until we decided to just to throw the birds into the structures which gave the birds the final win. A wave of cheers went off around the room. The kids stuffed their faces with the birds, pigs and cake. 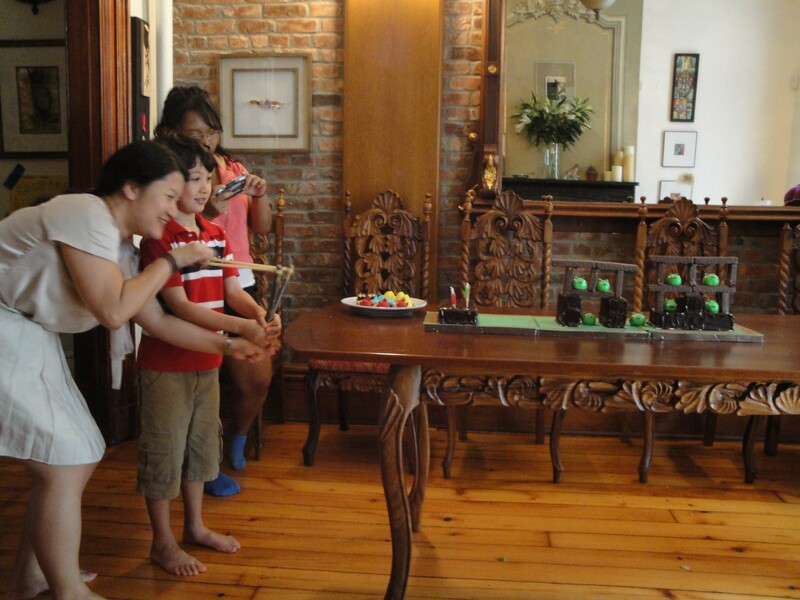 Judging from the reactions of the kids, I think the cake turned out to be a great success. The smiles from the little faces were truly a Kodak moment which made the hard work worth all of the effort. 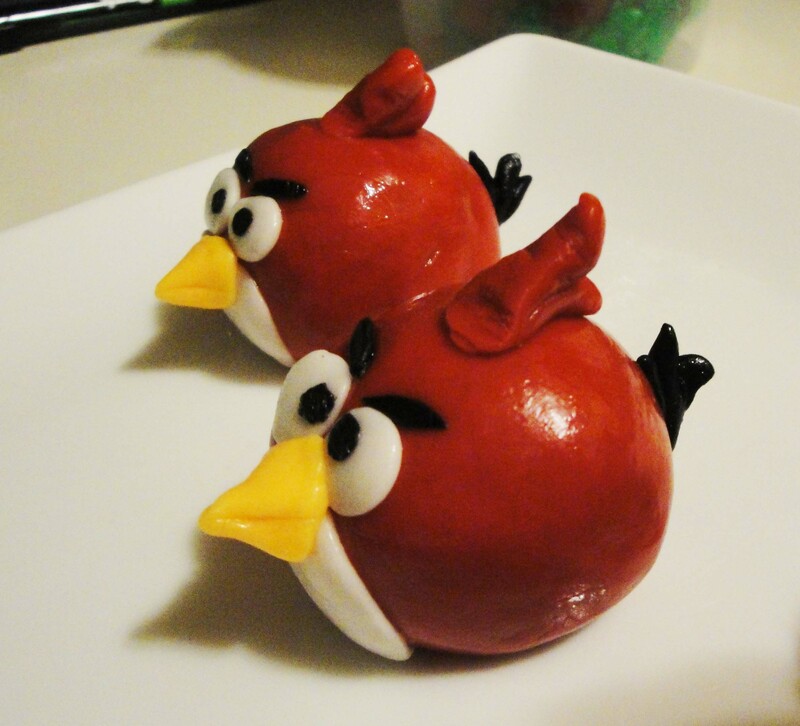 As I reflect on this wonderful adventure of making the Angry Birds cake, I am grateful for friends and a husband who had faith in me and believed in my abilities. I am humbled to be reminded that all my abilities given by God. May He be glorified in all that I do. 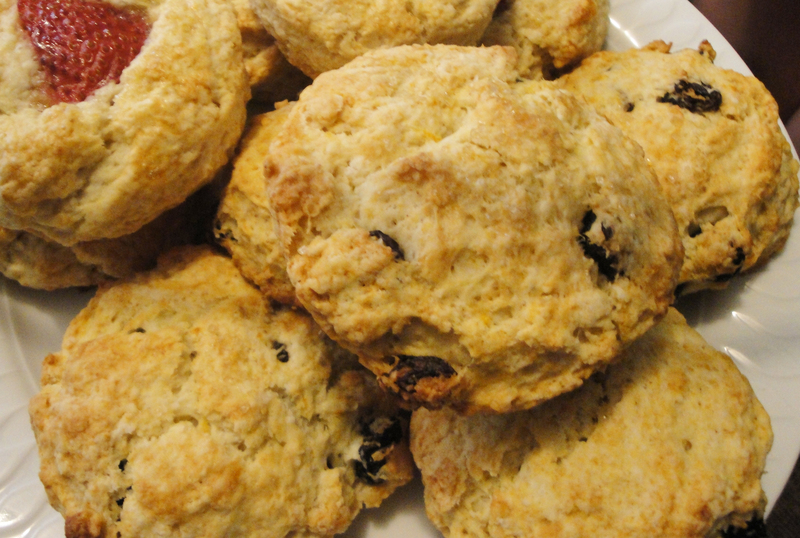 Most of the time we do not have the luxury of enjoying a scone fresh from the oven. However, by heating up the scone in the microwave for 10 seconds or 20 seconds if you took the scone out of the freezer, you will find that it tastes as though it just came out of the oven! I personally love to top my scones with plenty of cream and jam. Authentic Clotted cream or Devonshire cream, unfortunately, is virtually impossible to be found in the US. But don’t despair! 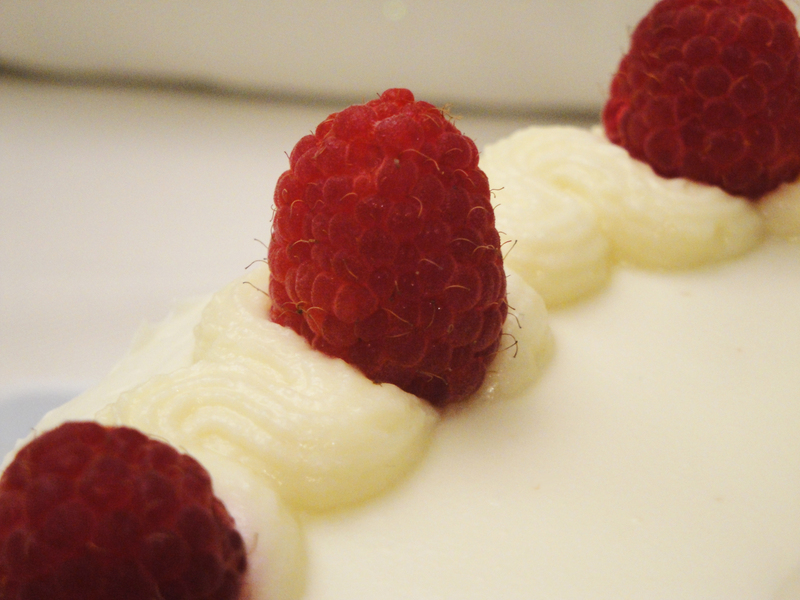 A quick and easy substitute is Whipped Cream. Use generous amount of Whipped Cream in the place of clotted cream and add some fresh fruit jam on top a warm scone will make every bite of that scone heavenly! 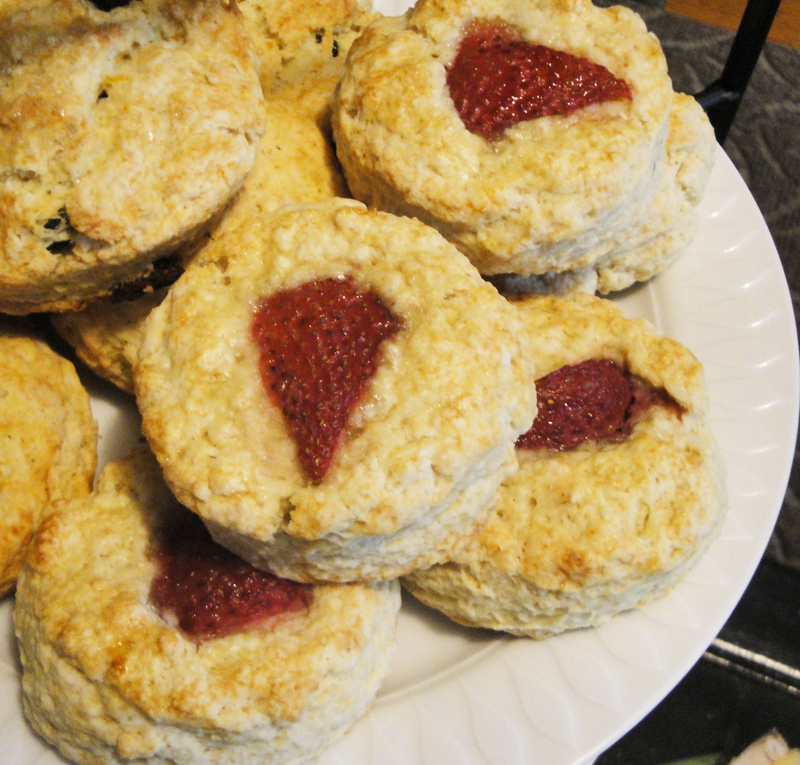 Here are 2 new flavors that have been added to the line of Scones at Twee-tea-licious. 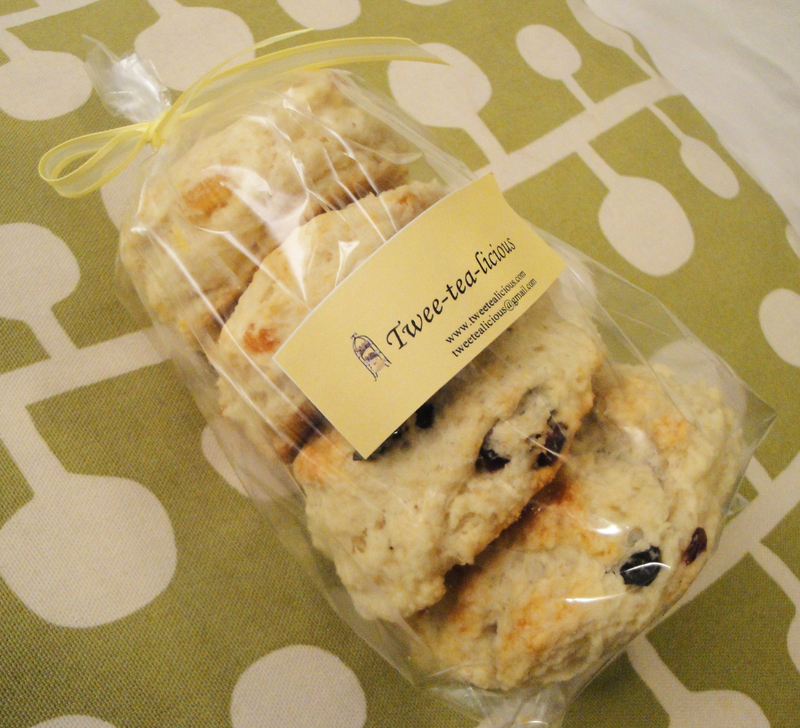 The Twee-tea-licious scones are now sold in a bag of 4 or a box of 1 dozen. Scones are best consumed within 24 to 48 hours of purchase. You may freeze baked scones in tightly wrapped plastic and aluminum for longer storage. 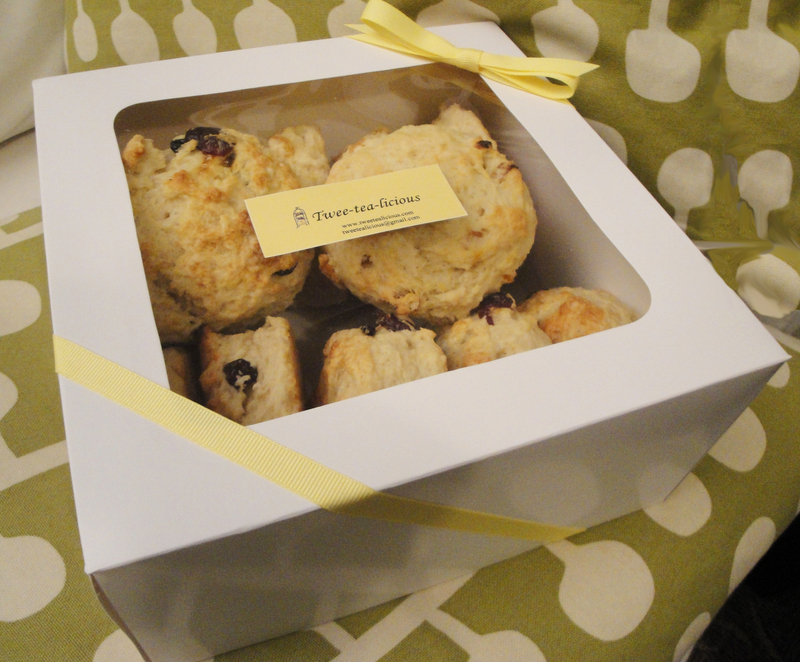 Here are 2 new flavors that have been added to the line of Scones Twee-tea-licious. 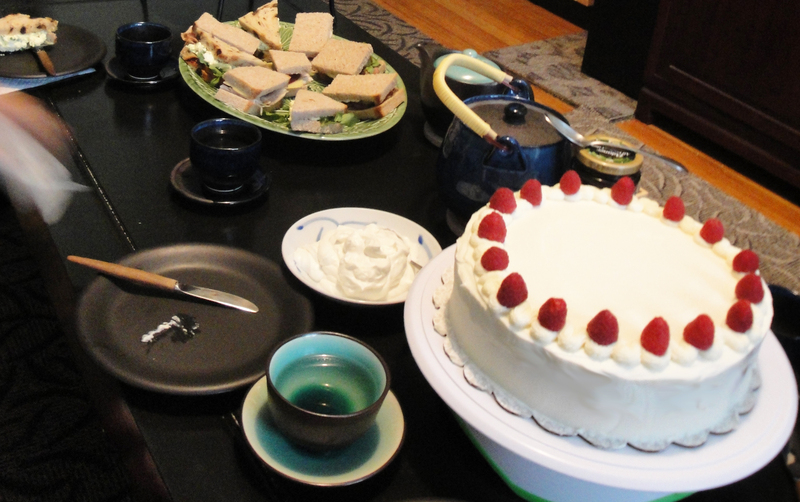 I have been hosting a number of afternoon teas at home recently as a great setting for old friends to catch up and for new friendships to blossom. What better way to relax with a cup of specially selected tea along with all freshly made sandwiches, desserts and good conversation? I only wish we can do this everyday. and preservative-free raisins. The taste of scones fresh out of the oven with generous amount of whipped cream and jam is just heavenly! If you don’t have the luxury of having a scone fresh out of the over, see my post “How to have a Scone at its Best” for tips. A warm scone makes a world of difference in taste! These scones are now available for purchase at https://tweetealicious.com/scones/. Next up on the menu were two kinds of delicious finger sandwiches made by two friends who specialize in savory food. One was with turkey, smoked sharp cheddar, cranberry sauce and topped with a horse radish mayonnaise on cinnamon raisin bread. The other was a roast beef sandwich with carmelized onion topped with a spicy honey mustard sauce on whole wheat bread. 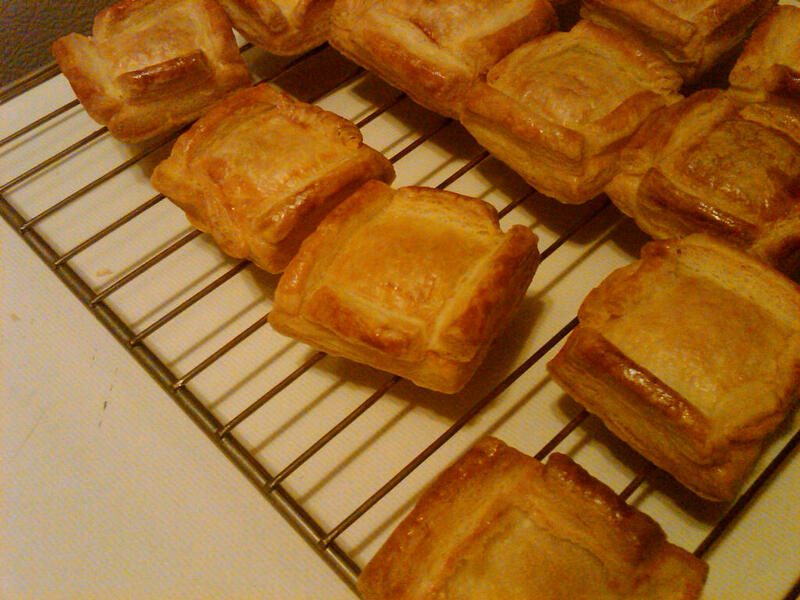 For pastries, I made some filled-to-the brim cream puffs that were freshly piped. Store bought cream puffs tend to become soggy quickly. 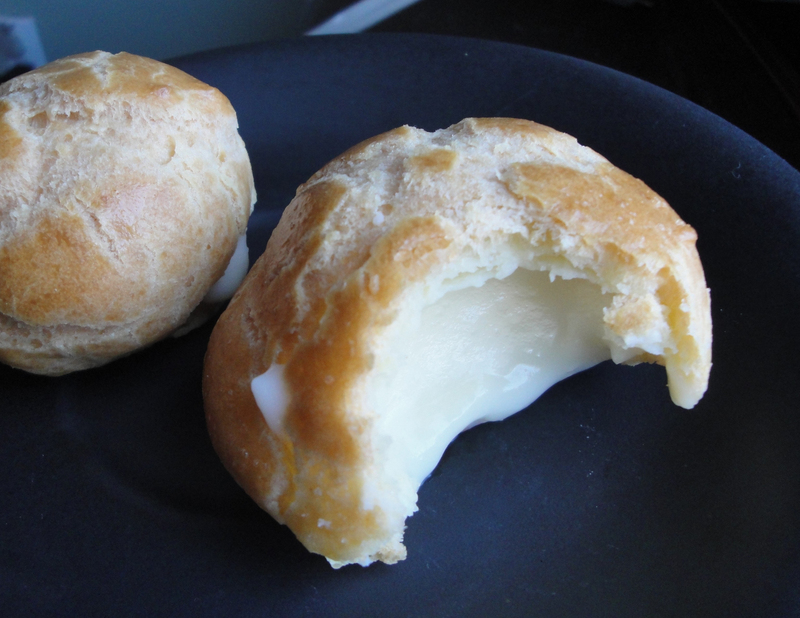 With these home-made cream puffs, you could taste the still crusty shell with that nicely sweet and creamy vanilla pastry cream dripping from each bite. In addition to the cream puffs, I made a new flavor of Shortbread Cookies – Chocolate Chocolate Chip. This cookie flavor was inspired by my friend, Pat, who had requested a double chocolate cake for her birthday. 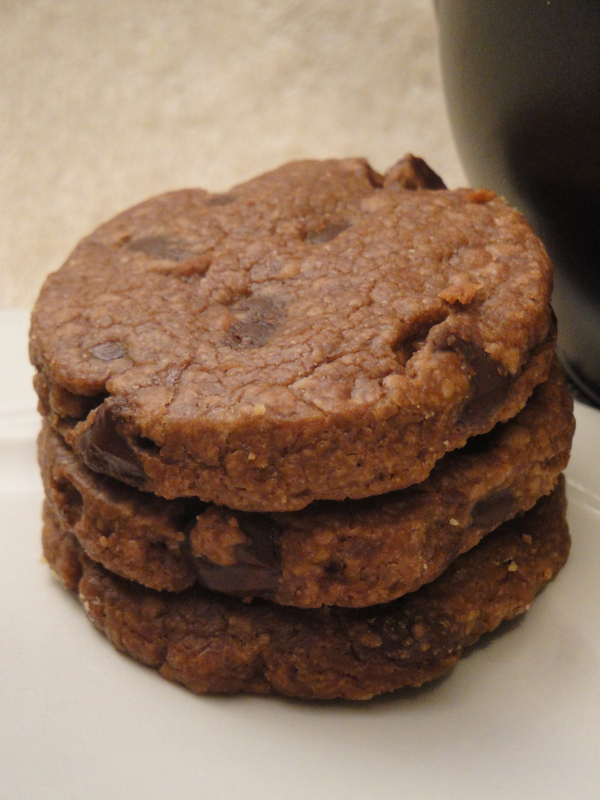 These Chocolate Chocolate Chip cookies were made with gourmet quality cocoa powder and one of the highest rated chocolate chips. They are buttery, with a full chocolate taste, and with a nice bite of chocolate chips that are of just the right softness. These are now available for purchase at https://tweetealicious.com/cookies/. 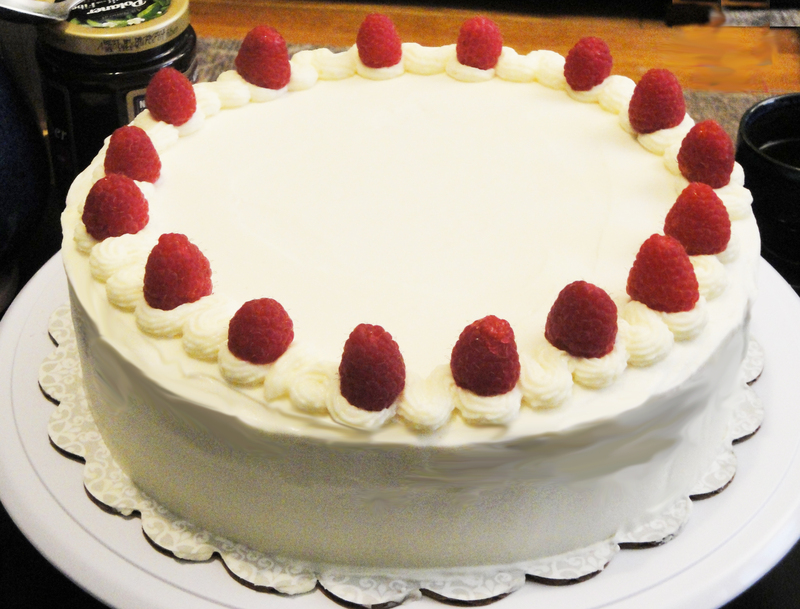 To complete the afternoon tea experience, the final item is a delicious and moist Brown Velvet Cake frosted with a beautiful cream cheese frosting. 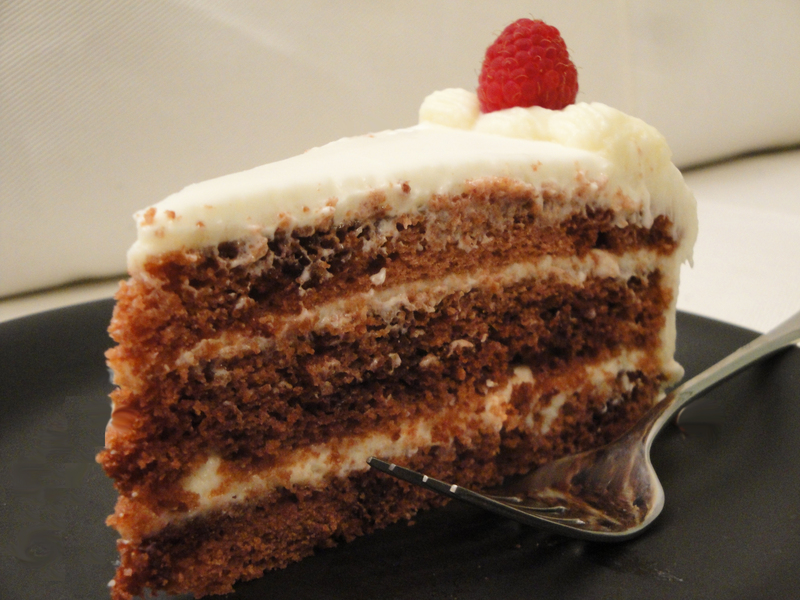 It is essentially a Red Velvet Cake without all the red coloring. As I cringe at the idea of putting in the amount of red coloring from all of the recipes I see, I decided to go all natural. The taste? Fantastic! The not so sweet cream cheese frosting was a perfect balance to a velvety textured chocolate cake. Finally, we have two drinks to accompany the wonderful afternoon tea time. For our tea selection, I used a white tea, courtesy of my friend, Lisa, from Chambre de Sucre Gourmet Artisanal Sugars (http://www.chambredesucre.com). The tea was very fragrant and smelled and tasted wonderful. For our cold drink, my friend, May, made a great virgin mojito that consisted of fresh mint, lime, agave nectar and seltzer water. 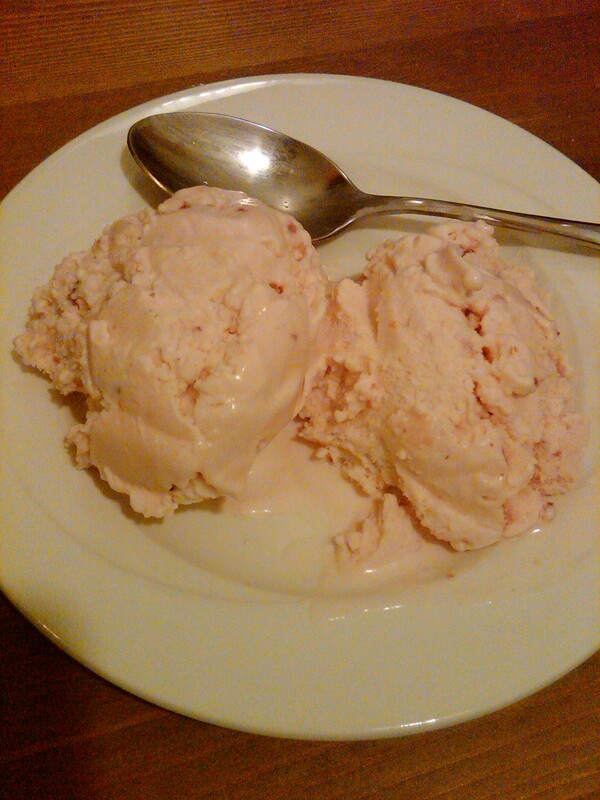 It was delightfully refreshing. I hope you will also have the opportunity of enjoying afternoon tea with some wonderful friends. If you ever want to have an afternoon tea catered, please email me at tweetealicious@gmail.com. 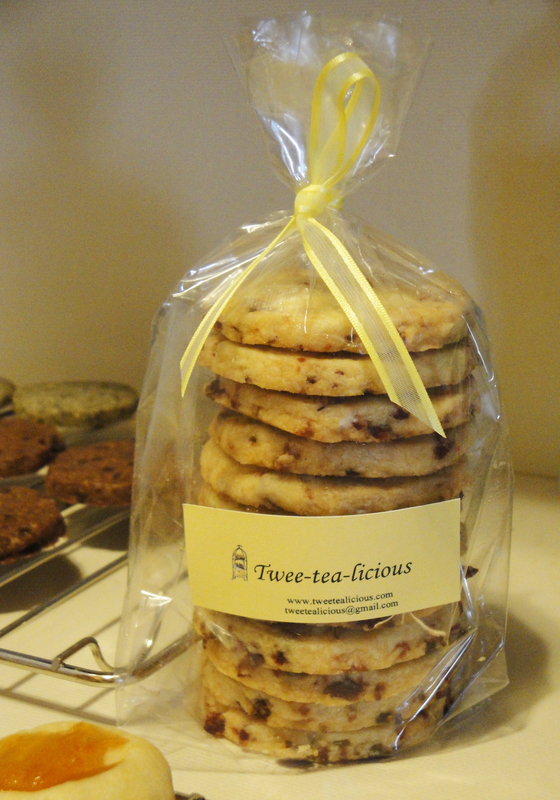 Twee-tea-licious will be one of the sponsors at a fashion show benefit, on July 14, 2011, to raise funds for Japan Society and Shelter Box for disaster relief efforts around the world and in Japan. There will be a fashion show along with auction, raffles and some great desserts! 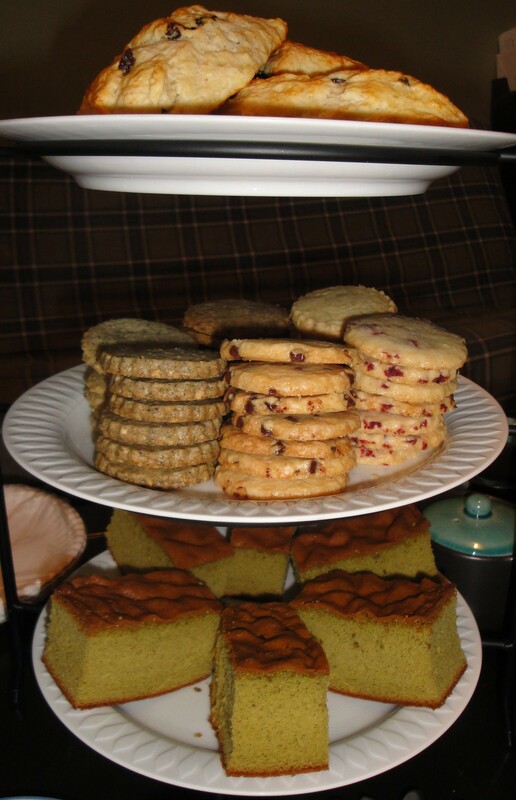 Twee-tea-licious will be serving several flavors of delicious shortbread cookies at the event. For more information, please go to http://www.nycsakura.org/. Hope to see you there and thank you for your support.